The Story of Julian Mantle. 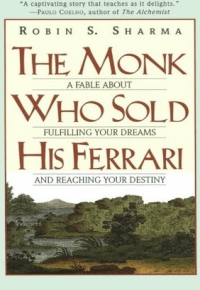 Julian mantle the legitimate lawyer has been earning a seven-figure income never has a thought that one day, he woke up in the small room of ICU and having bread and water in breakfast. After hearing the message from the doctor, Julian decided to quit law career and begin to travel the path of spirituality to find inner peace. 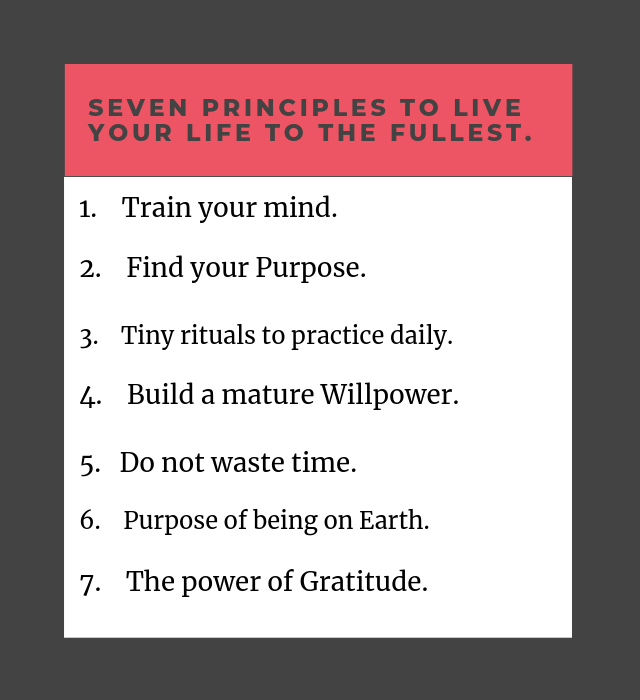 In the journey of inner-piece, Julian found seven principles to live your life. Your mind is sort of garden. If you make effort to nurturing, fertilizing. It will pay you off in the long term. You must protect the mind from the negative thoughts that came to visit it. An average person thinks about 60,000 thoughts throughout the day. The untold truth is ninety-nine percent thoughts have come from the same sources or same situation. To become successful you know how to operate mind. Like any other muscles, you can train brain muscles to work according to your guidance. The first techniques to become the master of your mind. All you need a yellow rose and a quiet place at home to do this exercise. Take a corner place of a room, sit down, hold a rose in your hand and begin to stare at the center of the rose. In the beginning, it is difficult to concentrate on the rose but with time you will develop the ability to do. Start with five minutes per day and keep extending the time as you become habitual of it. Practice this activity at the same place and at the same time for the next twenty-one days. 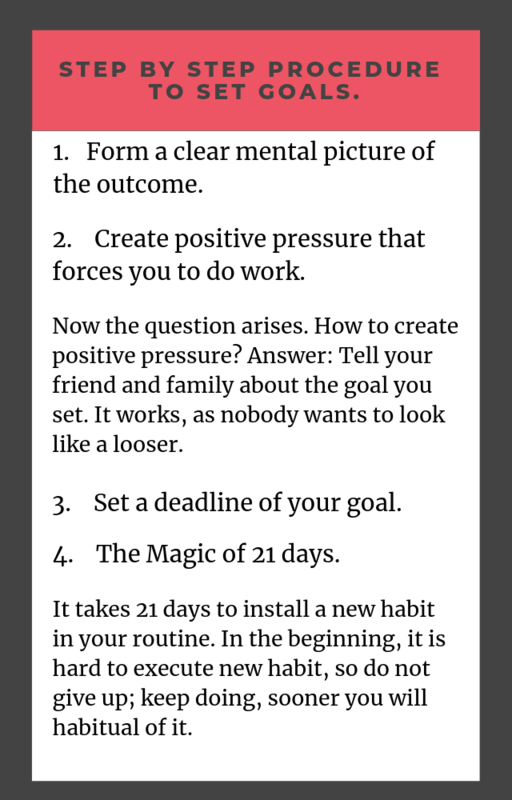 As it takes twenty-one days to install a new habit into your routine. The second technique is to wear a prayer bead around your neck. So every time negative thoughts pop up in your mind, take a single bead out it, and place it in a glass. This technique reminds you the road need to be travel to become master of your mind. Happiness comes from achievement but without goal setting, you will not achieve anything. Find the purpose of your life, make goals and write down on the piece of paper. As I said, we thought sixty-thousand thoughts on an average day. Writing goals send signals to the subconscious mind that states this single thought far more important than other 59,999 thoughts. Then, the sub-conscious mind provides precious mental energy to carry out goals. Tiny rituals to practice daily. Ritual of Solitude: Solitude is sort of activity that works like a rest break of your overheated engine (Mind). All you need to do this activity is a quiet place at home or in office. After getting a quiet place, sit down and relax your mind. Do not move your body; just enjoy the silence in the air. Begin with five to ten minutes in a day and increase time duration as per your comfort level. To get most out of it. Practice it at the same time and at the same place. Ritual of Knowledge: Reading thirty minutes a day will increase your knowledge. Reading has the ability to do wonder in your life but be selective about books you read. As Robin Sharma said, “Books have all the answer to your question.” The knowledge you grab from the book will assist you to become a better person and make a better environment around you. Ritual of self-reflection: The day you start implementing the activity, you will subtle become a better person. The time to do the activity is; prior to sleep. Like any other activity, you will need a quiet place. Take some time to identify productivity and unproductivity hour of the day. This activity confronts you wasted time in your day. Once you know the activity, you can take immediate action to fix it so that you will not repeat the mistake again. Ritual of music: Music can influence your mood, makes your heart singing and can motivate you. Adding ten minutes of listing music in your chunk can enhance your happiness level. Ritual of sleep: The average person sleeps six hours a day and can remain perfectly healthy and happy. Excessive sleep is a habit just like any other habit. Remember the quality of sleep matter not the quantity of sleep. Sleeping six hours a day in a quiet place can make you feel better than sleeping nine hours a day in the noisy environment. Sleep is just a recharge period that body needs to function better. Ritual of spoken word: The series of mantra you use to redirect your mind from negativity to positivity. The word you use on daily basis form your outer world so choose your word wisely. Ritual of radiant living: The step requires taking daily action to improve your character and strengthen your belief. The character you build through actions and persistence will help you to reach your destiny. Ritual of Diet: Diet has huge impact on your vitality. A bad diet will drain mental and physical energy and it also hampers the quality of your thought. Start adding healthy fruits and vegetables in diet. Ritual of Exercise: Exercise adds more energy in a day. Exercising thirty minutes a day add more years in your life. Ritual of simplicity: Adopt behavior of simple living. Willpower assists you to do tasks that are right to do but you never do it. The question arises ‘How will you generate mature willpower? The first step to generate willpower is to start doing the things you fear. As you do these things you will need the willpower to carry out a task. The formula of getting willpower: The more you use it, the mature it becomes. The second techniques to generate willpower is to spend your days without speaking. Develop the habit of gratitude. Gratitude for the small things you have. The more you gratitude, the more you have. Practicing gratitude increase happiness in life and in lives of others around you. Teach yourself, today is the day to live your life to the fullest, not tomorrow or not the day you win a lottery. Purpose of being on Earth. Find the purpose of life. Start doing the work you love, that add value to the life of others. Time is the most precious commodity. We all have twenty-four hours a day but effective time management separate successful folk from average folk. Who Will Cry When You Die.